Who needs to do this? If you are one of the millions of current or former AT&T customers who would like to use Windows Live Mail, to bring their web mail to the desktop, you may want to use the following steps for setting up AT&T Windows Live Mail. Windows Live Mail is part of Microsoft’s Windows Live Essentials suite, the goal of which is to merge local and wide area network functionality seamlessly. 1. You should see the option to begin the wizard to add your AT&T email account by clicking on ‘Add email account’. 2. On the next screen, enter your AT&T email address and password. Check the boxes to manually configure your settings and for Windows Live Mail to remember your password. 5. Your email address would go where test@att.net is shown. Send yourself a test email and then ask someone else to send you a test email. 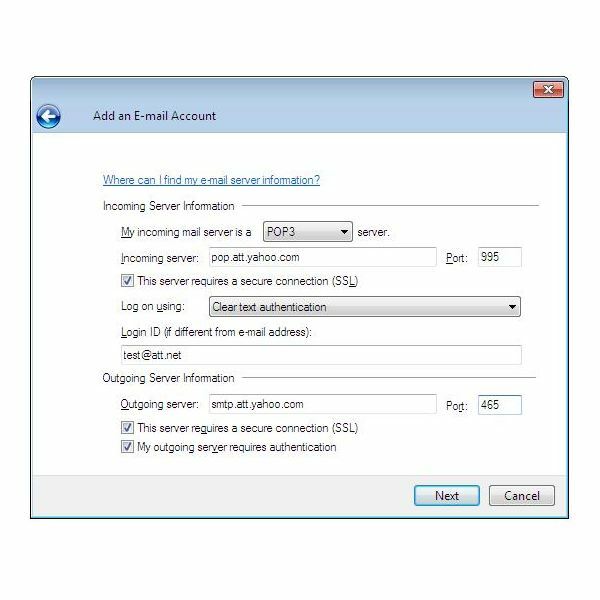 When you send yourself a test email, use the Windows Live Mail client to do this, as this will test both the incoming and outgoing settings for the client. Depending on the time of day and your connection, it can take from one to five minutes for the test to complete. If you are not seeing the test emails, check online at the webmail site to verify the emails arrived there. Failure to send or receive messages usually results from an error in the entry of the address or the password. One way around this is to type them on a notepad document, then copy and paste them into the respective fields. Another cause for this problem is unchecked boxes for requiring authorization. If you are using a laptop for the account, be advised that you will only be able to send mail via Windows Live from your registered location. However, you will be able to receive mail from any location. If you have both a laptop and a desktop with Windows Live Mail configured for your AT&T account, go to the ‘Advanced’ tab and check the box marked, ‘Leave a Copy on the Server.’ Otherwise, when you retrieve messages from one computer the other computer will not be able to download those messages. Using Windows Live Mail to access you AT&T email account offers a number of possibilities, including a wider range of options of stationery and image inclusion. You should have no problems in configuring it for Windows Live Mail as the wide popularity of both features ensure a quick and painless deployment, along with ready solutions for issues that may arise. Taking a few minutes will allow for the best of both services to be enjoyed by you and your family.